When the United States decided to invade Afghanistan to grab Osama bin Laden—and failed, but stayed on like an unwanted guest—could it have known that the Afghans were sitting on some of the world’s greatest reserves of mineral wealth? We’ve raised this topic before (see here)—where we noted the dubious 2010 claim, published by the New York Times, that “the vast scale of Afghanistan’s mineral wealth was [recently] discovered by a small team of Pentagon officials and American geologists.” Other evidence, and logic, point to the fact that everyone but the Western public knew for a long time, and before the 2001 invasion, that Afghanistan was a treasure trove. So we were interested to see a new piece from the Times that emphasizes those riches without stressing the crucial question: Was the original impetus for the invasion really Osama—or Mammon? The failure to pose this question is significant because the pretense of a “recent discovery” serves only to justify staying in Afghanistan now that the troops are already there—while ignoring the extent to which imperial-style resource grabs are the real drivers of foreign policy and wars, worldwide. As long as we continue to dance around that issue, we will remain mired in disaster of both a financial and mortal nature. As long as we fail to tote up who are the principal winners and losers then we fail to understand what is going on. Some of the least likely candidates for insight are waking up. 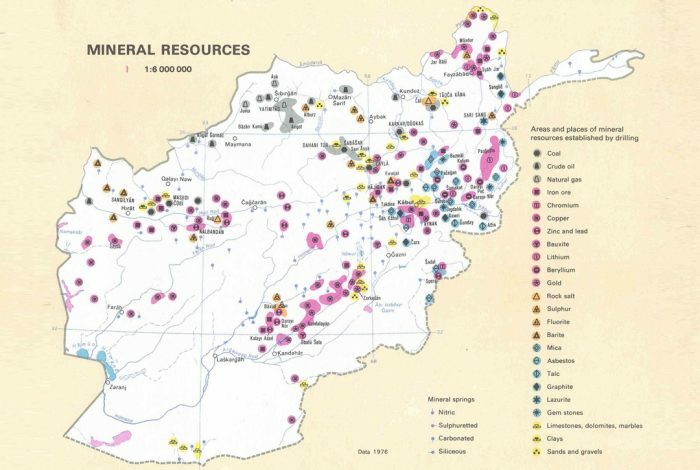 To quote Alan Greenspan: “I’m saddened that it is politically inconvenient to acknowledge what everyone knows: the Iraq war is largely about oil.” Who will say the same about Afghanistan and its mineral wealth? Once we acknowledge what General Wesley Clark claims (and which the media keeps ignoring)—that he was told the U.S. had plans ready at the time of the 9/11 attacks to invade seven countries (including Iraq and Afghanistan)– then the larger picture begins to come into view. At this point, we can’t help but revisit our WhoWhatWhy exclusive tying the 9/11 hijackers to that very reliable U.S. ally, the Saudi royal family— which itself needs constant external war and strife throughout the Middle East to keep its citizens from focusing on its own despotism and staggering corruption, and to maintain its position as an indispensable ally of the West in these wars. It was the actions of the Saudi-dominated 9/11 hijackers and their Saudi sponsor, Osama bin Laden, that created the justification for this endless series of resource wars. So, learning that the hijackers themselves may have been sponsored by, or controlled by elements of the Saudi royal family is a pretty big deal. If there is a road to a happy ending in Afghanistan, much of the path may run underground: in the trillion-dollar reservoir of natural resources — oil, gold, iron ore, copper, lithium and other minerals — that has brought hopes of a more self-sufficient country, if only the wealth can be wrested from blood-soaked soil. So, according to the world’s most influential opinion-making outlet, the fact of Afghanistan’s mineral wealth has nothing to do with why the United States and its allies want to stay—and why others want us to leave. No, we are told, it is just a fortuitous “discovery” that can benefit the Afghans themselves, make them “self-sufficient.” If only it can be extracted…..
Of course, this narrative continues, the suffering Afghans can only be helped to become self-sufficient if enough long-term military and technical might is applied to the country. Already this summer, the China National Petroleum Corporation, in partnership with a company controlled by relatives of President Karzai, began pumping oil from the Amu Darya field in the north. An investment consortium arranged by JPMorgan Chase is mining gold. Another Chinese company is trying to develop a huge copper mine. Four copper and gold contracts are being tendered, and contracts for rare earth metals could be offered soon. The truth is, as long as the Chinese and Russians are cut in on the deal, their objections to military actions that enrich oligarchs everywhere are likely to be muted. Imperial militaries exist in large part to grab and hold resources vital to the continuance of empires, while their paymasters back home reap benefits. That includes the rest of us, who must balance the security and creature comforts this approach provides against the death and destruction it inevitably entails. And we can’t begin to do the moral calculus until we acknowledge what’s being done in our name around the world, and why. There are 135 comments Our Comment Policy: Keep it civilized, keep it relevant, keep it clear, keep it short. Please do not post links or promotional material. We reserve the right to edit and to delete comments where necessary.